This episode of PT Podcast is with Chris Wilson. Chris Wilson is currently a physical therapist with OSU Sports Medicine at The Ohio State University Wexner Medical Center. 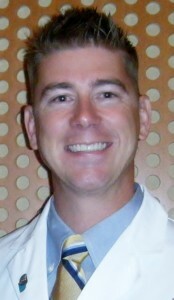 He earned his Doctor of Physical Therapy from the University of Cincinnati in 2013 after earning his B.S. in Health & Sports Studies from Miami University in 2003. Between his undergraduate and graduate studies, Chris served as a Munitions Officer in the U.S. Air Force and later worked for a small, private IT company as a project manager and business developer. Chris’s physical therapy related accomplishments include being selected as the only student innovator at the APTA’s inaugural Innovation Summit, winning an essay contest to attend the APTA’s State Policy and Payment Forum, winning a student business concept contest to attend the Private Practice Section’s Annual Conference and delivering a platform presentation regarding his research on the reliability of two different measures of thoracolumbar rotation at the AAOMPT Annual Conference. He is currently serving as a member of the State Affairs Committee of the Ohio Physical Therapy Association, assisting the Faculty and Student Affairs Committee of the OPTA in Student Networking Endeavors and is a member of both the Sports Section and Private Practice Section of the APTA. Previous story Are your patients out of control?